in:spire with is delighted to host an hour's music-making with internationally acclaimed piano trio, the Lawson Trio. 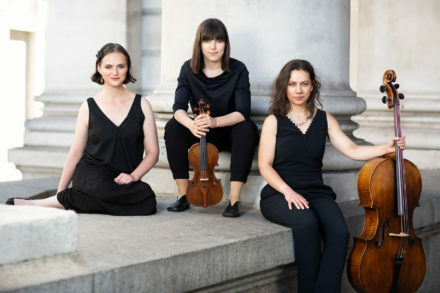 Recognised both for their performances of the cornerstones of the trio repertoire as well as lesser known works and their own new commissions, the Lawson Trio has appeared at major venues including London’s Wigmore Hall, King’s Place, the Southbank Centre, and at many UK music societies and international festivals, with live concert broadcasts given on BBC Radio 3 and ABC Classic FM. The ensemble’s debut CD ‘The Long Way Home’ was released in 2012 on the Prima Facie label through ASC records. This disc, which features four of the Trio’s own commissions, as well as a recent work by Mark-Anthony Turnage, received a five-star review in BBC Music Magazine, and enthusiastic reviews in Classical Music Magazine, the Sunday Times and the Independent. In 2018 the Trio collaborated on a disc of premiere recordings of works by Gordon Crosse, including his Piano Trio revised for the Lawsons in 2012. The Lawson’s commissions number new pieces for the genre from British composers David Knotts and Cheryl Frances-Hoad and they have had works gifted to them by Gordon Crosse, Anthony Powers and Camden Reeves. They have also worked with composers Judith Weir, Cecilia MacDowall and Hugh Wood, for performances of existing repertoire. High-profile premiere performances of new work have included the complete set of works from their CD debut, recorded at the Southbank Centre for BBC Radio 3’s ‘Live in Concert’ programme. Committed to bringing new audiences to classical and contemporary music, the Trio is constantly involved in educating young musicians through workshops, masterclasses, combined performances and interactive concerts, and especially through its work as Associate Ensemble to the Chamber Music 2000 contemporary music initiative.